Dozens of pharmacists, student pharmacists, and technicians from throughout the state gathered in San Antonio May 4–5 for TPA’s inaugural Women in Pharmacy weekend. The two-day conference offered ample opportunities for both continuing education and networking among women (and men who support women) in the profession. Topics ranged from financial management and pharmacy ownership to personal development and work-life balance, concluding with a panel discussion about using one’s professional skills to make a difference. The event also featured two memorable Aspire and Ascend lunchtime presentations from former State Senator Leticia Van de Putte and TPA Chief Executive Officer Debbie Garza, both pharmacists. TPA’s online Women in Pharmacy Forum remains available as a complimentary service to members. The next webinar will feature Women in Leadership on May 22. Sign up to receive more information about this and other future events, and to listen to the recording of the April 19 audio conference on Industry Insights with Sandra Guckian of NACDS and Ronna Hauser of NCPA. Participants display their "power pose" at the Women in Pharmacy weekend. TPA Chief Executive Officer Debbie Garza and President-Elect Mark Comfort attended the 2018 State Pharmacy Association Leadership Conference, presented by the National Alliance of State Pharmacy Associations (NASPA) and Pharmacists Mutual, May 6–8 in Kansas City, MO. The annual event brings together the CEOs/executive directors and presidents-elect from state pharmacy associations across the nation. This year’s program included an amazing panel of national pharmacy CEOs plus discussions about governance, financial management, public awareness, and a variety of other topics. Among the attendees was Steve Anderson, CEO of the National Association of Chain Drug Stores (NACDS). Anderson will be a featured speaker at the 2018 TPA Conference and Expo in The Woodlands, July 13–15. 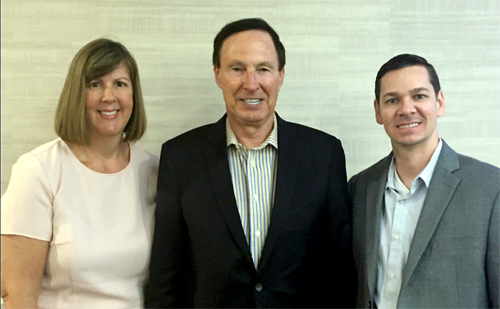 TPA CEO Debbie Garza and President-Elect Mark Comfort with NACDS CEO Steve Anderson (center), who will speak at the 2018 TPA Conference and Expo in July. National associations’ CEOs, L to R: Doug Hoey (NCPA), Steve Anderson (NACDS), Tom Menighan (APhA), Mike Maddux (ACCP), and Lucinda Maine (AACP). The Texas Pharmacy Congress (TPC) held its quarterly meeting May 9-10 in Dallas, hosted by Dean Quentin Smith of Texas Tech University School of Pharmacy. The TPC comprises all nine Texas colleges/schools of pharmacy, TPA, TSHP, TFDS, and the TSBP. After hearing reports from each college and organization, the discussion focused on advancing Texas pharmacy, pharmacy as a profession, and promoting pharmacy. A strategic planning process will be undertaken at the next meeting in August. Thank you to Dean Smith and his faculty and staff for their hospitality. On Tuesday, the Texas Health and Human Services Commission's Value-Based Payment and Quality Improvement Advisory Committee held its second meeting of the year--and the first to include a pharmacist. Benjamin McNabb, PharmD and owner of Love Oak Pharmacy/Love Oak, LLC was appointed to the committee at the end of March. Also joining the committee in an ex officio capacity was Joseph Ramon III, RPh, CEO of Health Care Unlimited, Inc. Among the key agenda items, Stacey Johnston of the Texas Vendor Drug Program provided an update on the study of value-based models for pharmacy. HHSC has contracted with the University of Massachusetts to conduct the study and anticipates the report being published in June. Other topics included a legislative update on interim hearings relating to improving quality and efficiency, draft recommendation options for the 2018 legislative report that the committee will provide to the Texas Legislature, and future direction for improving quality and efficiency. Click here to view a copy of the agenda and to watch a recording of the meeting. The Texas House Human Services Committee held a hearing Thursday to continue discussions on Medicaid Managed Care, this time hearing from those dependent on Medicaid. The hearing lasted nearly twelve and a half hours. Chairman Richard Raymond (D-Laredo) opened the hearing with Health and Human Services Commission Chief Policy Officer and acting Chief Operating Officer Victoria Ford. Ford used her testimony to address ongoing issues that plagued the agency in recent months and resulted in the termination and resignation of a number of top agency staff including the recent resignation of Health and Human Services Executive Commissioner Charles Smith. Following Ford's testimony, State Medicaid Director Stephanie Muth and HHS Inspector General Sylvia Hernandez Kauffman provided a brief update on the Medicaid program and agency oversight. Chairman Raymond then opened the hearing to public testimony, allowing more than 100 individuals to provide nearly 11 hours of testimony. Common themes from the public testimony included medication access issues and low provider reimbursements resulting in provider access issues. Texas lawmakers split sharply Tuesday on President Trump's plan to claw back more than $15 billion in congressionally-approved spending, nearly half of which would come from a children's health program that provides coverage for 400,000 kids and pregnant women in the state. Texas received more than $1.2 billion in federal funding for the CHIP program in the 2016 budget year. Legislation backed by NACDS to help address the opioid abuse epidemic was passed Wednesday by the House of Representatives Energy and Commerce Committee. The bill — the Every Prescription Conveyed Securely Act (H.R. 3528) — would require electronic prescribing for Schedule II through V controlled substances prescriptions covered under Medicare Part D to help prevent fraud, abuse and waste. A White House spokesman said President Donald Trump will deliver a speech Friday on lowering drug prices. HHS Secretary Alex Azar will attend, but no additional information was given about the speech. Senators raised concerns about the rising cost of insulin and the complicated pricing system at a May 8 Senate Aging Committee hearing. Novo Nordisk, sanofi-aventis and Eli Lilly and Co. control 99% of the insulin market, and senators are puzzled by the lack of competition and may consider requiring more transparency in diabetes drug pricing. CMS has released the agency's first Rural Health Strategy, aiming to take proactive approach on health care issues for individuals living in rural parts of the United States. "For the first time, CMS is organizing and focusing our efforts to apply a rural lens to the vision and work of the agency," said CMS Administrator Seema Verma. A record 475 tons of expired, unused and unwanted prescription drugs were discarded for the DEA's 15th National Prescription Drug Take Back Day, according to the agency. This brings the total amount of prescription drugs collected by DEA since the fall of 2010 to about 10 million pounds. CMS Administrator Seema Verma told attendees at the American Hospital Association (AHA) Annual Membership Meeting that her agency aims to curb health care spending through initiatives that promote value-based purchasing, reduce administrative burdens, and lower prescription drug costs. To bend the health care cost curve, CMS and HHS will focus on implementing value-based purchasing to shift the health care industry away from paying for volume. DEA on Friday announced the issuance of an Immediate Suspension Order served on Morris and Dickson Company, a wholesale pharmaceutical distributor, located in Shreveport, LA. DEA alleges that this distribution center failed to properly identify large suspicious orders for controlled substances sold to independent pharmacies with questionable need for the drugs. A federal judge blocked the U.S. Drug Enforcement Administration from suspending a Louisiana drug distributor from selling controlled substances over allegations it failed to identify suspicious orders of opioids that were diverted for illicit uses. Although it's unclear how many people who have diabetes use complementary and alternative medications to lower blood glucose, researchers indicate that this is an ‘emerging trend.’ A number of complementary and alternative medications can potentially lower blood sugar, and many patients look at these substances as more natural than synthetic drugs. George Barrett, executive chairman of Cardinal Health, apologized Tuesday for the company’s role in facilitating the flow of highly addictive analgesics into U.S. communities, the first time a corporation has expressed regret for involvement in the opioid crisis. Mylan reported on Tuesday that U.S. consumers may have difficulty getting EpiPen prescriptions filled after manufacturing problems constrained supply. Food allergy groups have been pressing U.S. regulators for answers after more than 400 people in 45 states indicated that they have had trouble getting prescriptions filled for the potentially lifesaving autoinjectors of the drug epinephrine. FDA said it does not believe there is a shortage. FDA has approved a lower-volume polyethylene glycol-based (PEG) bowel preparation. Polyethylene glycol 3350, sodium ascorbate, sodium sulfate, ascorbic acid, sodium chloride and potassium chloride is the lowest total-volume preparation bowel cleanser available in the United States and the only FDA-approved bowel cleaning to offer split dosing on the same day as colonoscopy procedure. Walmart will restrict initial acute opioid prescriptions to a seven-day supply, beginning within the next 60 days, the company said. In January, the retailer said it would begin giving customers packets of powder to help them destroy leftover medication as part of efforts to rein in opioid abuse. Gene therapies to cure hemophilia might be priced at $1.5 million or more, according to Leerink analysts. Existing hemophilia treatments cost between $580,000 and $800,000 a year for adults and can top $1 million a year for some patients, which may make a one-time $1.5 million treatment seem like a bargain. Telehealth is evolving into virtual health care that includes a variety of digital technologies, but there still is a reimbursement hurdle to overcome, experts told the American Telemedicine Association conference. Payers and providers have faced challenges creating a payment model for virtual health care. Whatever President Trump suggests to lower U.S. drug costs, don’t forget this cold, hard fact: It’s extremely difficult to make sweeping reforms to a health-care system as piecemeal as ours. The story line sounds familiar: a popular pain drug becomes a new way to get high as prescribing by doctors soars. But the latest drug raising red flags is not part of the opioid family at the center of the nation's drug epidemic. It's a 25-year-old generic pill long seen as a low risk way to treat seizures, nerve pain and other ailments: gabapentin. A major insurance claim or lawsuit can lead to devastating financial loss. But a Personal Liability Umbrella can help safeguard you and your family’s wellbeing. 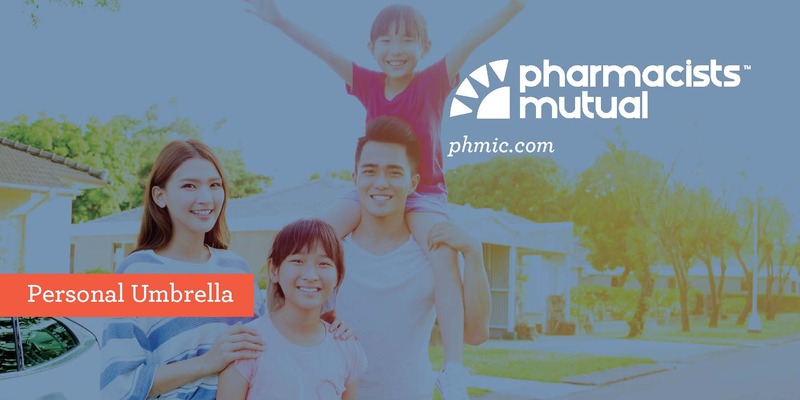 A Pharmacists Mutual Personal Umbrella policy picks up where home, auto, boat, and other primary personal insurance limits leave off. Learn more by visiting www.phmic.com or by calling (800) 247-5930.